On the way home this afternoon, I’ll be picking up our weekly box from the farm where I worked last summer, the Nitty Gritty Dirt Farm. I love that moment when I heft the box into my arms, and through the crack at the top, the fragrance of basil wafts into my nostrils. I close my eyes and scenes from weekly harvest morning at the farm unfold in my imagination — the dawn chill and dew, the insistently bleating sheep and goats, the wheel barrows brimming with freshly cut produce, the endless washing and sorting and bundling, the ache in my stomach stemming from eating too much raw cabbage or watermelon, the freely winding–and often hilarious– conversations, the bountiful table at noon, and the scramble to load the cars and trucks in time for delivery. In Chapter 7 of Receiving the Day, Bass reflects on the ways that the times and seasons of our wider society and our individual lives connect with the rhythms of the church year and of our spirits. August is a season of abundance. 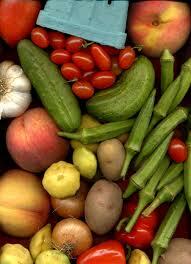 Cooks and eaters wallow in the fresh, fragrant fruit of the earth, feasting on the goodness of sunshine itself. Students savor the last days of vacation before school begins. Outdoors-people sneak in as much hiking and camping and boating as possible. In the church, we start bustling around to prepare for the heightened energy of the fall programs. I need to get home to those veggies from the farm, to Jen and Eliza, and to some Sabbath time, so I’m going to close this reflection some questions I hope you will ponder and respond to. Where is the abundance in your life? What helps you savor it, breathe deeply of its fragrance, store up its goodness, rest in its plenty? And what keeps you in a mindset of scarcity? What gets in the way of getting in touch with abundance? Last night, my now 8 year old son, Nelson, and I went to the Saints game. It was the summer social for the MN Association for the Education of Young Children, of which I am board co-president. Our executive director resigned on July 1, and our new ED starts Monday. It has been a rewarding, but very consuming process of hiring a new ED and trying to keep the work of the organization moving, while also meeting the needs of my full-time job! Nelson and I had so much fun, together and with others at the event. It was hot, but we didn’t care. He had a can of pop AND a slushie, and I didn’t care. After we were home and he was ready for bed, he said, “Mom, will you read to me, since it’s mother-son night?” So, for the first time in a long time, I read aloud to my son who has at least two or three “chapter books” going at a time. The abundance of love in that one request is something that I will treasure for a long time. I will come back to it when I’m feeling rushed, to remind myself that time doing something that doesn’t “have” to be done, is time well-spent. Kyra, thanks for sharing this sweet moment with us!